Aloha! We are grateful to the many Hā’ena and Kaua‘i folks who have contributed their mana‘o to this project. We are especially grateful to the Hui Makaāinana o Makana, Limahuli Gardens, and the Hanalei Watershed Hui. “I’m Japanese-Hawaiian. 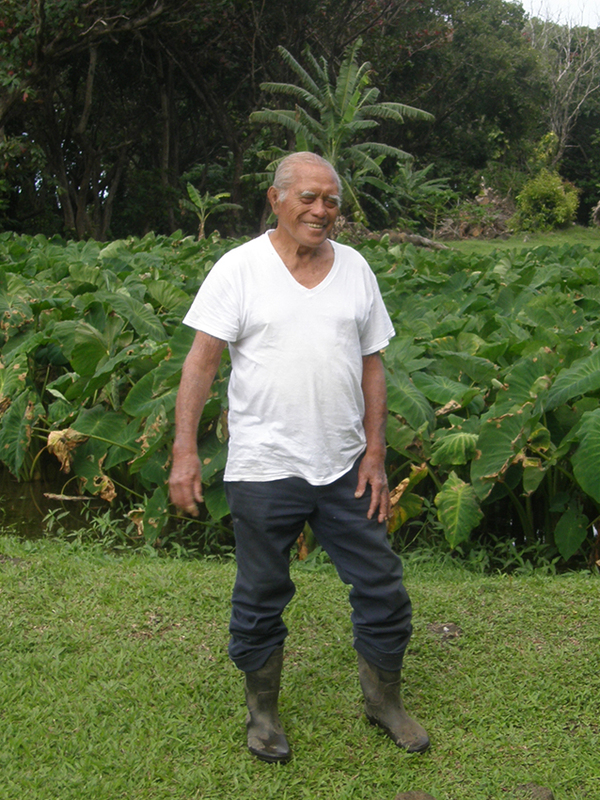 My grandfather came home from Fukuoka to the Kona onf the Big Island to plant coffee. And then my Dad came from there. 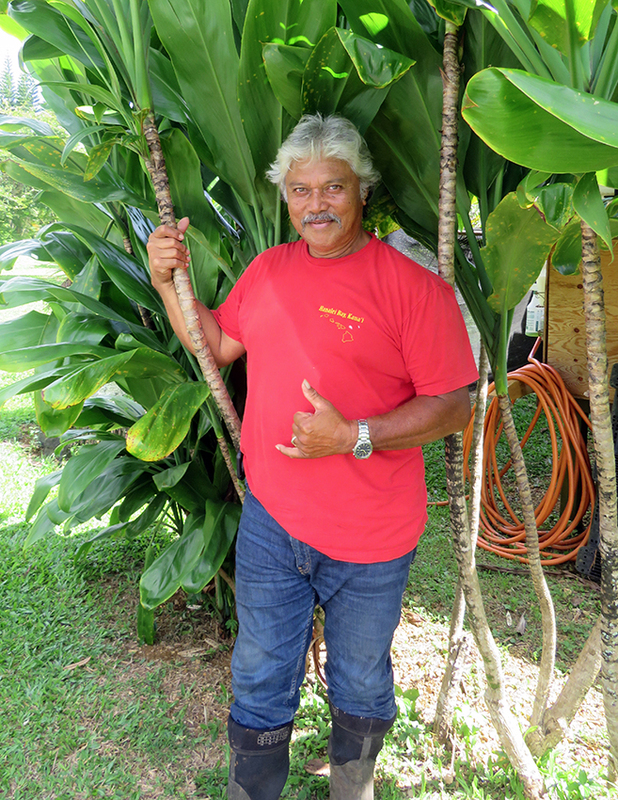 His uncle brought him over here from Big Island when he was 8 years old, and then he worked on the ship as a salamoku [deck hand] on those freighters that took all the cattle and the rice, the products from Waimea. “My journey began when I was twelve. My life, I picked up different games, and then now moreso. We had our own home charge and stuff, like making a garden, raising the chickens and stuff like that. And at the same time, doing stuff with our parents, like gathering hala and learning the way to do it. I hung around with the grand folks. But they would chase us away, because at the time Hawaiian was illegal, the Japanese language was illegal, and the language was English. So that’s why we didn’t learn, because my Dad was a terrific Hawaiian speaker, he could speak maybe better than the people today. “My Dad was pure Hawaiian. My mom looked Hawaiian! She was an orphan, her parents were old when she was born. We lived with one hanai child. Maybe nothing as sense as we think, you want one child you build a man. See if you’re busy and you need hands, that’s the best place for get them. Get one kid and then make him slave for you. “I’m from Hā‘ena. Unfortunately I wasn’t born in Hā‘ena but raised in Hā‘ena all my life. It’s just one of those things. I was born in ’58, so when came back here, I was not even a year old. My grandmother took care of me and Hā‘ena was always my home. But my parents are from there. I am 57 years old, I have a beautiful wife, I have two kids, a girl—a daughter and a son, and I have a little granddaughter. She is 8 years old. "And Hā‘ena is a very special place for me. Everything that surrounds Hā‘ena—just being in Hā‘ena—the life style that we grew up there in Hā‘ena—it’s so fortunate. I mean, really we’re just so lucky to have that passed on to us. And for me, that’s my life, that’s how I live." 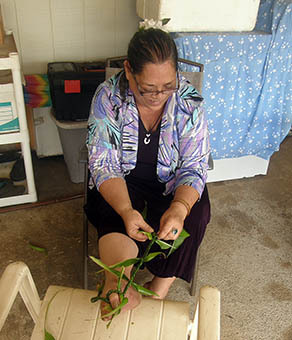 “I guess I am living the Hā‘ena style, what we were taught, how we were raised. And that goes from mauka to makai. It wasn’t an easy life back then. Free time—no such thing as free time in those days. Everything was 'do something that is going to be worthwhile—work.' My Dad was pretty strict. And I understand that. 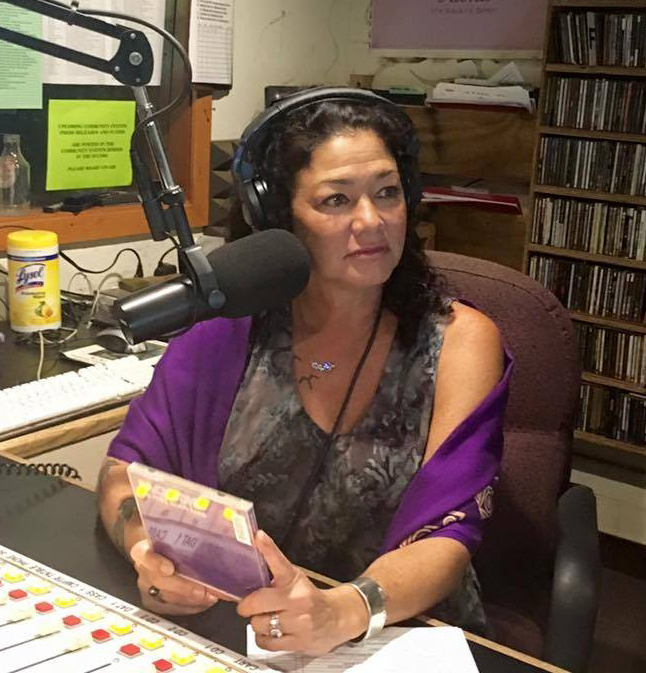 “I’m the current president for the Hui Maka‘āinana o Makana of Hā‘ena Kaua‘i. I became involved with it because I have family ties to that area. We’ve been there for generations. Our kuleana lands extended from the road below Limahuli Gardens, all the way to the ocean. We had that whole bottom piece. We call it Kamealoha but it was Kaukapaua (?) is one of the names for that kuleana, but we are all heirs of Kamealoha. 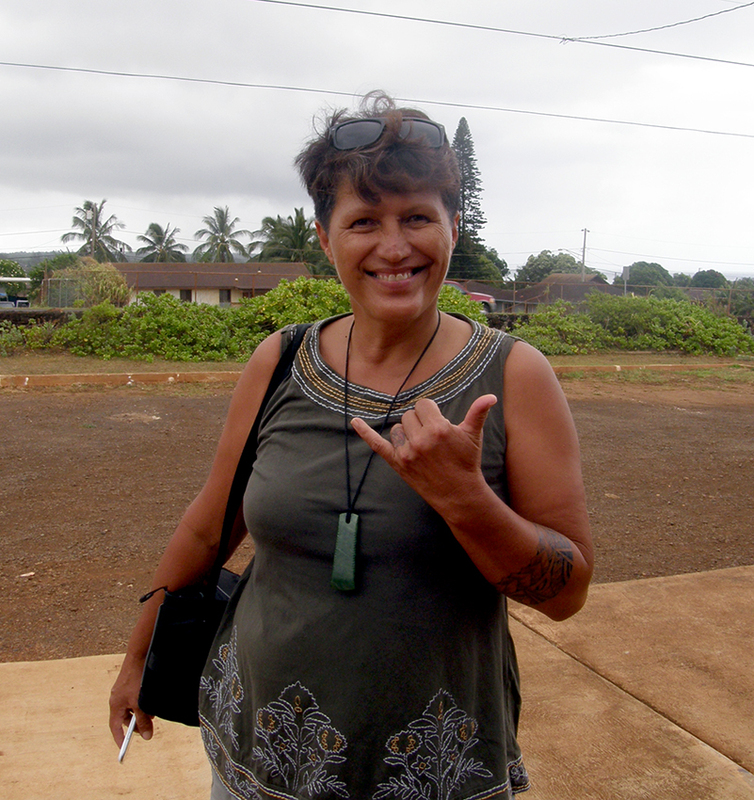 “I was being raised in Hā‘ena until I was 16 years old. Then we moved from Hā‘ena to Princeville, and then moved from Princeville to Kilauea in 1983 when my parents purchased a home. 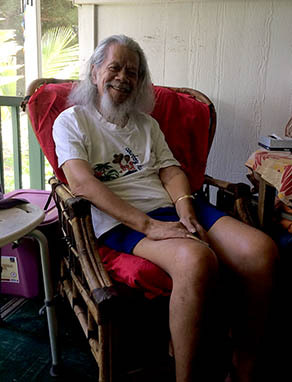 My grandfather Joseph Hashimoto was gifted a property in Hā‘ena by his uncle, Mahi‘ula. Keoni passed that property down to Grandpa. And so we lived there with my grandparents up until we moved in 1975 out of Hā‘ena. "My name is Lahela—my English name actually is Rachel—and Chandler is my maiden name. And I’m named after my Grandma Rachel Mahuiki, who was an incredible fisherwoman here. I was born and raised in Wainiha, that’s the valley one over from Hā‘ena. And my parents were born and raised in Hā‘ena. "The Chandlers moved from Maui. He was a judge. There was John Silas Chandler, was a judge on the south shore, Kalaheo or something like that. In the Chandler family, there were 14 siblings of my parents, my father’s side. They were born and raised right in Hā‘ena where Makua is, that’s one of front beaches and my father guys have fifteen kids. So we’re fifteen siblings. I’m number thirteen in line—on the bottom. And there were ten boys and five girls. So there’s a whole bunch of us here on the North Shore, which is the Wainiha Chandler’s. "There’s also the Kalihiwai Chandlers, there’s ten boys there, no girls. And on the other side, I believe very close to us, maybe ten or twelve kids, one of my uncles. And there is the west-side Waimea family. There’s more other kids, but we’re the majority of the Chandlers that have like ten kids. 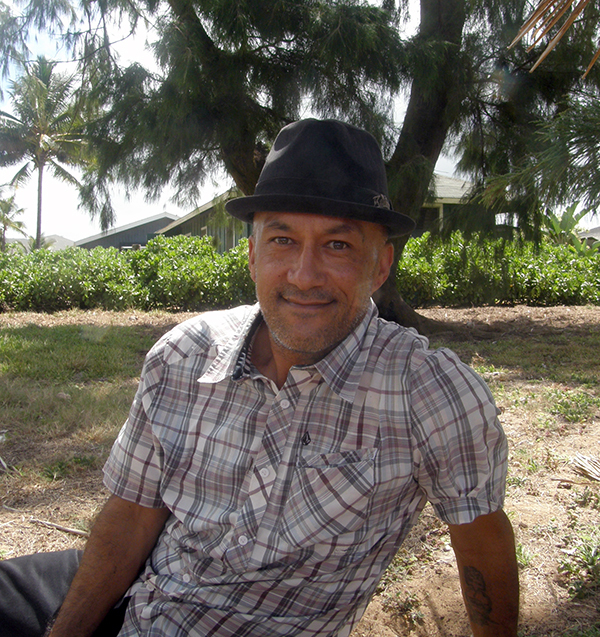 “Although not born in Hā‘ena, I spent many days and weeks there during my childhood, youth, and young adulthood. My father helped move a beachfront house back onto its foundations after the tidal wave of 1946. It had been picked up off the ground, turned around 180 degrees, and floated intact a hundred yard or so inland, where it was set down in a tangle of debris and hau, an indigenous variety of hibiscus. The owner, in reciprocation for my father’s assistance, permitted our family to use the house for several weeks each year for many years. “When I was thirty, it was in Hā‘ena that I met the woman who would eventually become my wife. In Hā‘ena, we and our first child spent the initial year of his life in a gardener's cottage next to Limahuli stream. He got his initiatial introduction to swimming there almost before he could walk. Although we left Hā‘ena to take up residence on family land in the Ko‘olau district, continuing visits to Hā‘ena in Halele‘a, calling on friends, working with the people, and seeking the thrill of the challenging surf there increased, strengthened, and nourished relationships with this special place. Two siblings followed our firstborn, all of them learning to swim in the pond at Limahuli near the cottage we had occupied formerly. 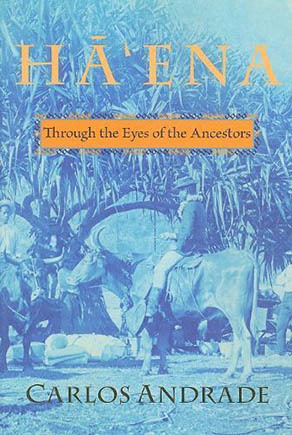 Material is also drawn from a book Carlos wrote about Hā‘ena: “My book Hā‘ena: Through the Eyes of the Ancestors is based on my dissertation research. 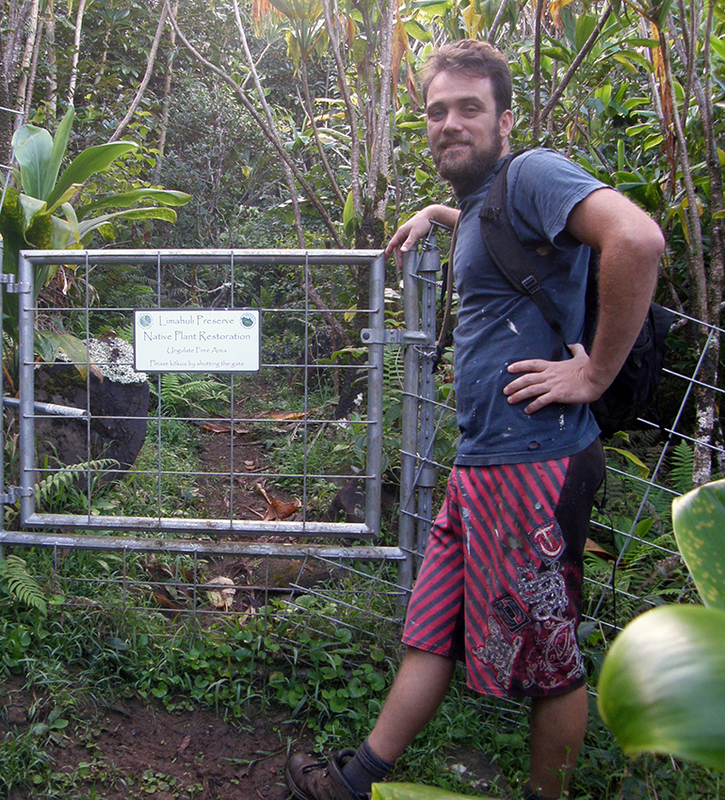 I chose Hā‘ena because it’s just a rich place for my kind of research interests: the ‘āina and all that it contains. I’m part of the community in a way, in that I live in this community, I work with these people, like Barlow Chu, who is Presley’s uncle. He knew my father and I knew him long before I wrote this book. “I was born Kāne‘ohe. I’m not from this island. I’m in Hanalei because I married a Hanalei boy and I did not ever intend to do this work, but I was given the name Makaala in the traditional way at the age of one, by my mother’s sisters. Much to my mother’s chagrin, because the name Makaala—'eye' and 'path'—means 'watchful, vigilant,' and it tends to be an assignment. That’s what those women meant for it to be, and my mother really didn’t want this life for me. She wanted me to be a good little housewife and mommy and stay home. "Her mother is the tree from which this apple falls. Her mother—my grandmother—was a suffragette and a college graduate in a time that that was a very rare thing. And she left the legacy in my DNA that by-passed my mother altogether. My mother was quite an accomplished water colorist in the 30’s and early 40’s in Hawai‘i, and held a prominent position in the Territorial Legislature as an executive secretary. But that’s as high as she aspired to go. 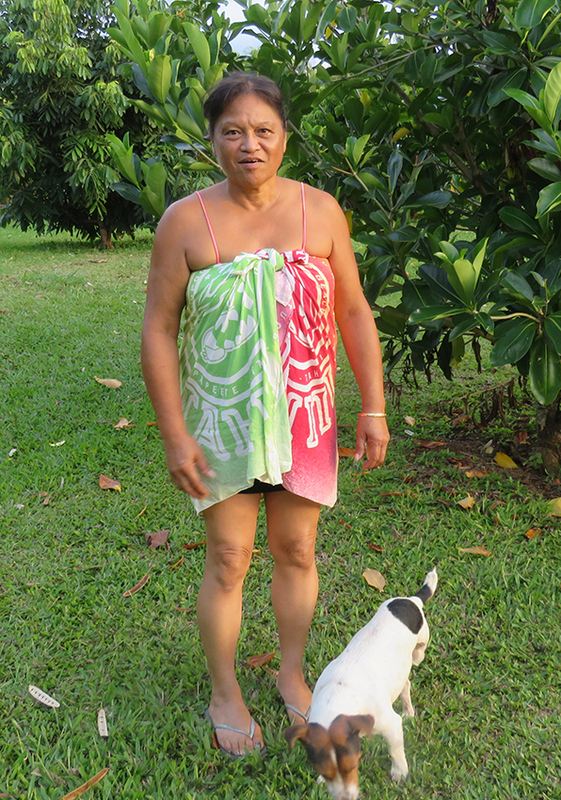 My mother’s family goes back five generations in Hawai‘i, so I am part Hawaiian. “I went to school in California and ended up staying there and having a career as a teacher—a nurse and a teacher and retired as soon as I could to come home. I went home to Kāne‘ohe and didn’t recognize my place. The house was still there, but I didn’t recognize the neighborhood, didn’t know any of the faces, and didn’t know any of the places. And that was in the late 80’s. 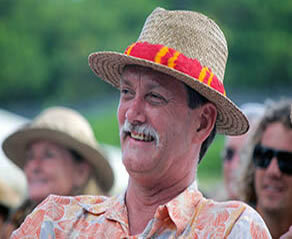 "I did what Hawaiians did in those old, old days: I got back on the airplane and came to Kaua‘i. Because Kaua‘i was the place where we came for refuge, for respite, for family gatherings. Almost every kama‘aina family had some roots here. I’m not sure how that happened, but it has always been a place that we would come to recreate or to escape, or to gather. So for me it was a safe place, even though I hadn’t been here in years. 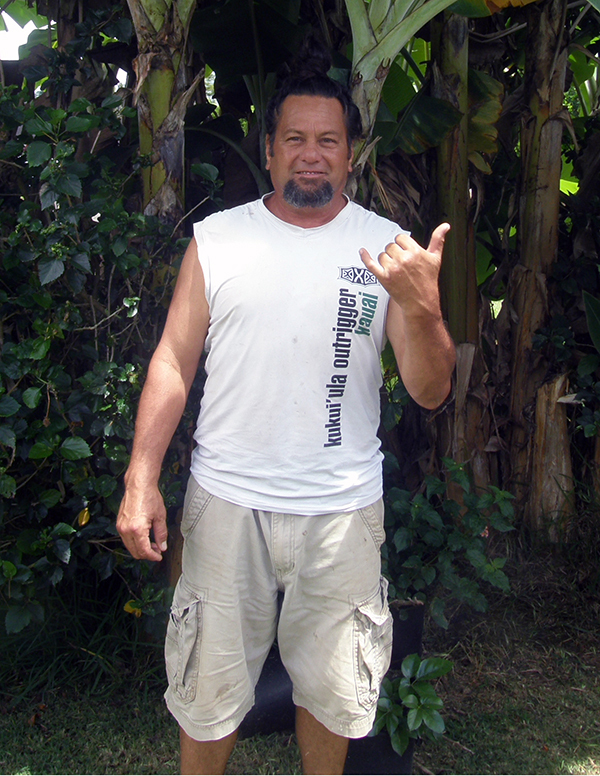 Chipper comes from an old kamaaina family in Hā‘ena. His ancestors have lived in Hā‘ena for five generations. 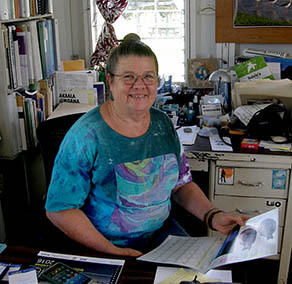 in 1976 Chipper's grandmother Mrs. Juliet Rice Wichman gifted the lower portion of Limahuli Valley, the larger of two valleys comprising Hā‘ena, to be a National Tropical Botanical Garden. 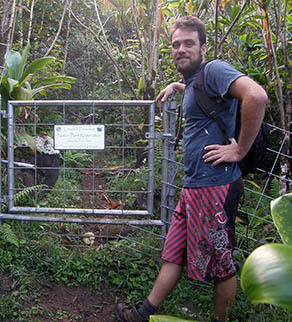 It is now known as "Limahuli Garden," and is directed by Chipper, who earned a Masters Degree in botany. 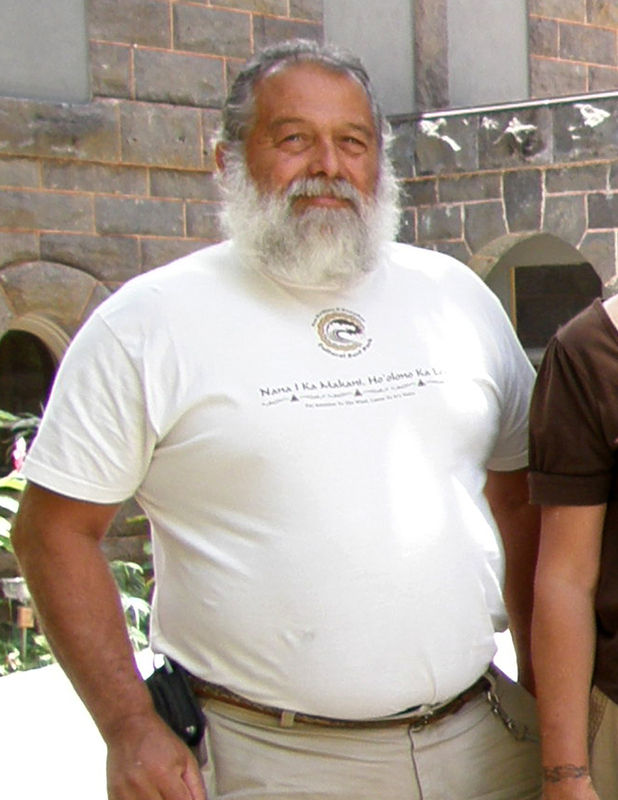 In 2003 Chipper took on the role of President, Chief Executive Officer and Director of the entire National Tropical Botanical Garden network. 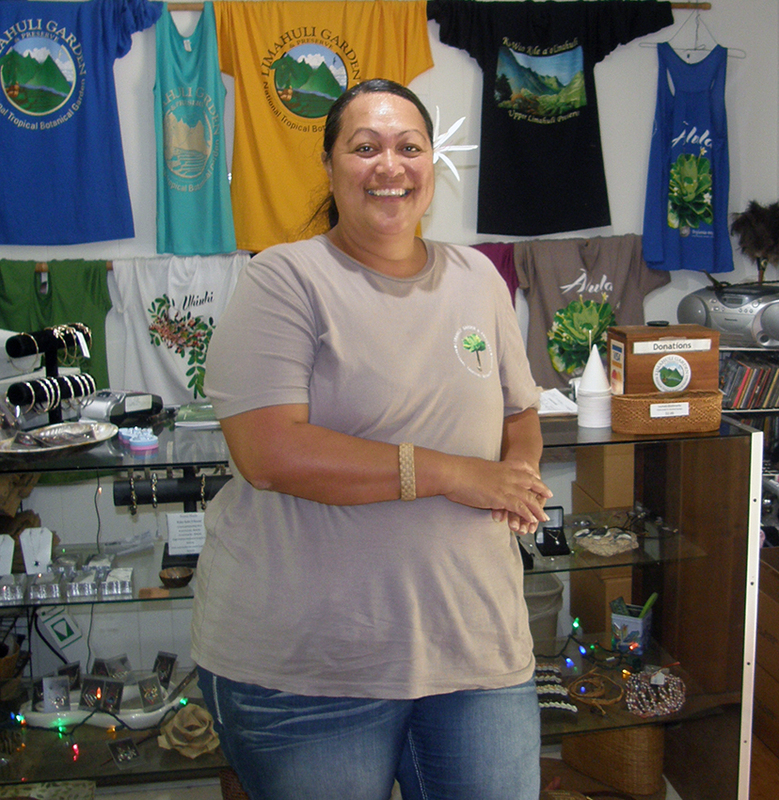 “I’m originally from O‘ahu, in the ahupua‘a of Wai‘alae, in the moku of Kona. 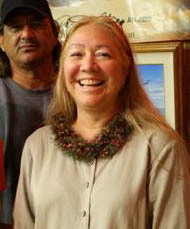 I moved here to Hā‘ena in 2005, to be the Director of Limahuli Garden Preserve, and I held that position until 2018. 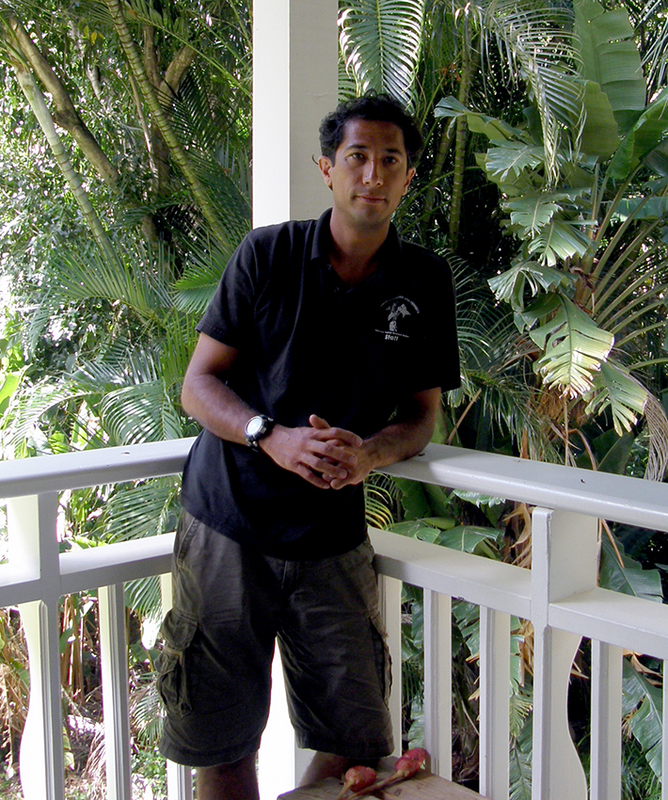 Since the summer of 2018 I have been a Research Associate with the National Tropical Botanical Garden, and I maintain several connections to Hā‘ena. 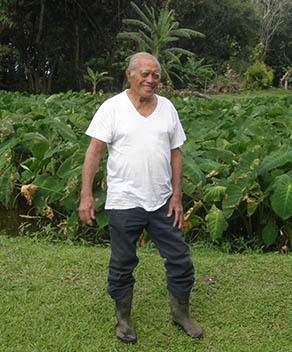 "As the head administrator of the work that happened in Limahuli I directed biocultural restoration of the mauka (inland) areas of this community, as well as the education and interpreative programs in the botanical garden. 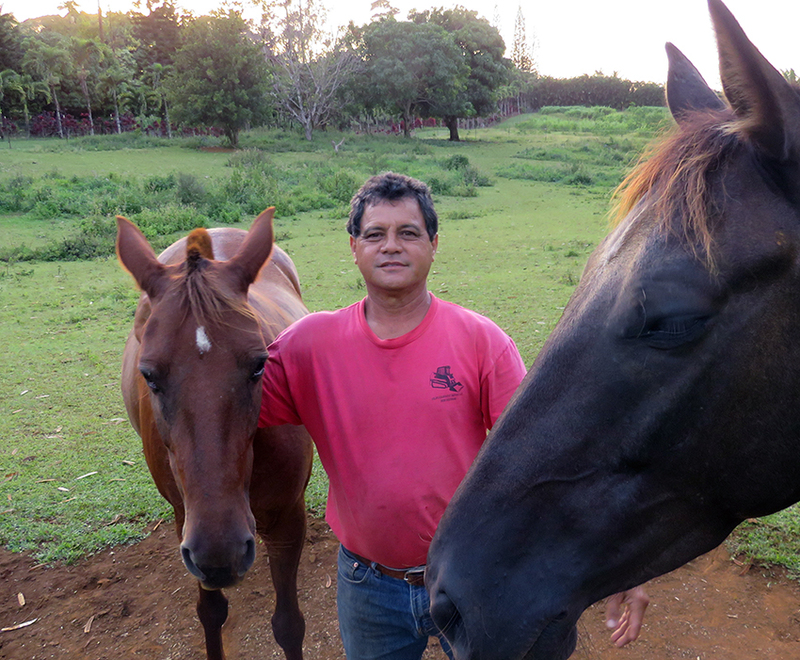 Our work is based on the ahupua‘a concept, so our work extends beyond the borders our property, which is this 1,000-acre valley. 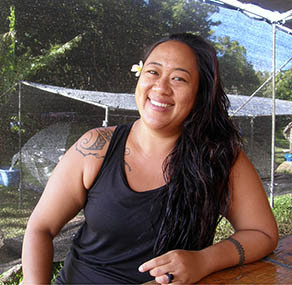 "Part of my job has been being involved in a lot of the community initiatives—heavily involved in the nearshore fishery management initiative (Hā‘ena Community-based Subsistence Fishing Area) that we have all been collectively working on for the past few decades. I have also been a lead collaborator in the Hā‘ena Ahupua‘a Alliance, which aims to work collaboratively towards the biocultural restoration of this place. In that role, I have helped to bring in and guide research that happens in the entire ahupua‘a—from the top to the bottom—that we need to inform our holistic, adaptive management of Hā‘ena. 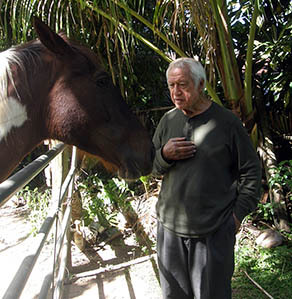 “And I’m a strong supporter of the Hui Maka‘āinana, and a collaborator with them via the Hā‘ena Ahupua‘a Alliance. 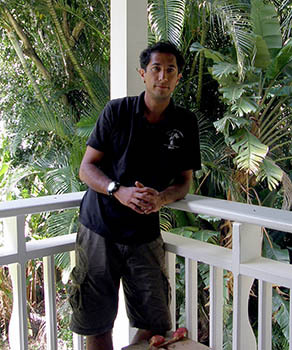 I have three degrees in Botany: Bachelors, Master’s, and Doctorate from UH Mānoa, with a focus in biocultural conservation. “I started hunting when I was young—seventh grade or sixth grade, just tagging along, learning, and then eventually the old guys give up and you carry on the tradition. Horseback, walking, every which way. I’ve hunted the whole island all the way around. Hunting was a necessity back in those times, not like nowadays. Everybody pretty much ate from the mountain and the ocean. We did a lot of hunting. My dad and my uncles fished a lot, but you actually only fish when you need to. Nobody really fished every day. You catch what you can eat, pretty much. That’s the way it went. “Mahuka is my great-grandmothers’ name and it refers to the heiau that are located in certain strategic points of the islands, which when lit up and connected form a time travel clock. So I come from a long line of women warriors that actually originated in Hā‘ena. That’s my connection to that area. Most recently I threw down the gauntlet with a multi-billionaire developer who was busily developing the last piece of coast line in Hā‘ena that had all of our mummies in the ground. So I’m very, very connected to the Hā‘ena area, in fact the only time I actually feel really normal is when I’m there. 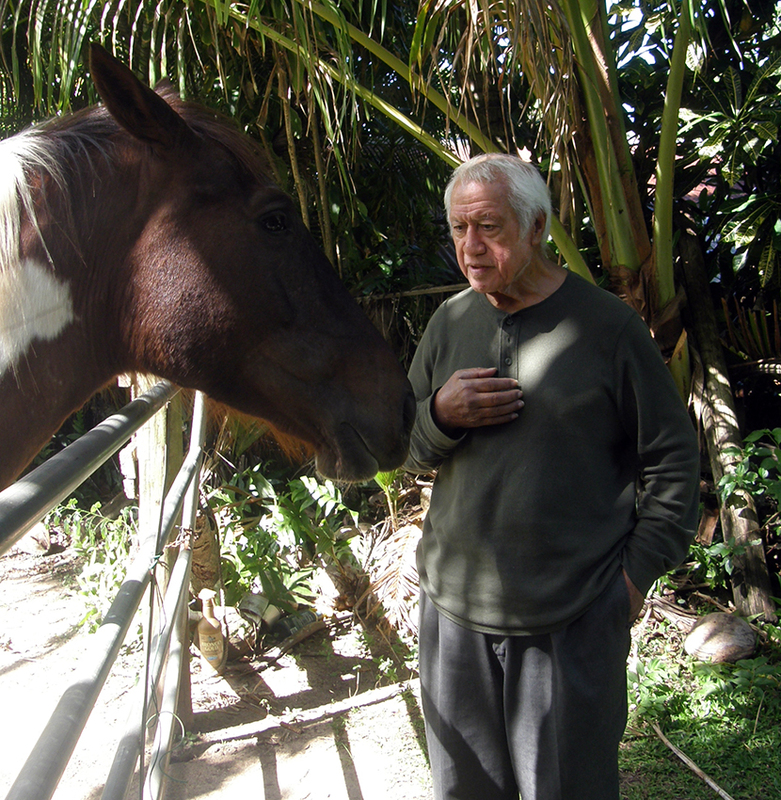 “I started learning native cultural practices through my father, who was of pure native Hawaiian descent. He had a job that took us globally, but no matter where we were around the world, he was my foundation for Hawaiiana. 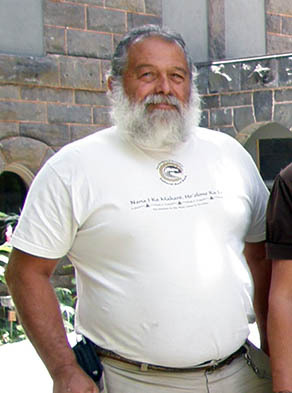 He was my first hula teacher, followed by my Aunty Hannah then later Kumu Joe K. Kahaulelio. "Papa tried to teach me ukulele, albeit I was too rambunctious to learn at the time.. As I got older, he and my mother encouraged us gals to find our own path, find what we felt comfortable with, and so I did. I established a career in San Francisco and all of that, and then decided to move to the islands while in my late 20’s. I’ve been blessed with many more native teachers along the way. “I was born on an Air Force base where my parents met, and that’s how we ended up traveling. My father’s family is the Kalilimoku family. His father’s side is from Big Island and Maui. His mother’s family is all Kaua‘i born and bred. Back then it seemed the Maui guys liked the Kaua‘i girls, and so Kaho‘ohanohano of Maui ventured to Kaua‘i to marry my great-great-grandmother from the Kalalau Valley. Many of our families come from that lineage,...anyone related to Kaho‘ohanohano who came from Maui to marry a beautiful gal from Kaua‘i. My great-grandfather Stephen Kila was Tutu’s first born. She was a master chanter in her own right. As comes with the turf, they learned all the many different elements involved in their craft, passing that information along to our family generations. So briefly, that’s my ‘ohana, and if you happen to see or hear the name Kalilimoku on your genealogy, then we’re definitely related." “I am a lineal descendent of Hawaiians who can trace their ancestry to the very first canoes that landed on Kaua‘i from Tahiti, as well as to the indigenous population that was discovered here by those very first canoes that landed in Hawai‘i. In this day and age, I consider myself to be a cultural practitioner in several cultural arts including the lua, healing arts, spiritualty and philosophies connected to the Hawaiian culture and the indigenous cultures of Hawai‘i. 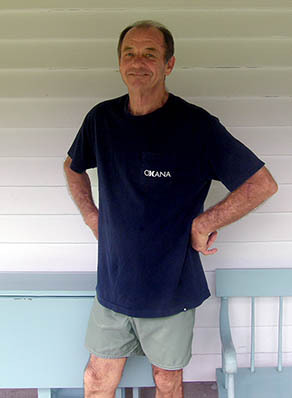 My connection to Hā‘ena goes back probably about 40 years in this time, beginning with my father who migrated to Kaua‘i Island and specifically to Hā‘ena from O‘ahu. 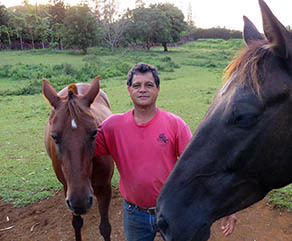 “I reside here on Kaua‘i. I am 75% royal Hawaiian and I’ve also got the Kahuna Nui bloodline from my father’s side where I have Kamehameha blood line from my mother’s side. I was raised by grandparents, who taught me the culture, and they always told me I wasn’t Hawaiian, that I’m an ali‘i nui, and just always to remember that. To this day I’ve always believed that I’m part of the Royal Family, and we’ve never disappeared we’re always still here. “My trade—how I help pay the bills—is I’m a mason, but I also do framework and construction, a lot of construction work just to survive. My particular Hawaiian culture area is lā‘au lapa‘au. I also like the fishing and anything to do with the ocean and the reefs, and the seaweeds and the ‘opihi. Almost like the beginning of the Kumulipo, how it is introduced. It’s how the beginning of the creation was. And I like to feel myself like that. “I originated from O‘ahu but we moved here when I was seven years old. We were not allowed to be part of anything Hawaiian except in hale pule [church] because my father was a Pentecostal minister, so Hawaiian culture—which included hula music and everything else—was not allowed in our home. It wasn’t until I went to Kamehameha Schools that I met a woman named Nona Beamer. And she started me on my journey to learn who, what, and why I am who I am. She became my first kumu hula. She allowed me in her classroom to be and feel Hawaiian at Kamehameha Schools when it wasn’t a practice to. I had a difficult time meeting both cultures, the Western culture and the Hawaiian culture. "I was actually trained to become a minister since I was three years old. I got to the point in my life where I chose entertainment, so I got disowned for a while but continued in the process of learning about who I was. Because I was a hula dancer, that was my avenue to learn more about my culture and music. I love music, both Hawaiian music and dance. “I’m from the ahupua‘a of Anahola, moku o Ko‘olau. I'm a Hawaiian purveyor of premium sandwiches and salads retailed island-wide. "Growing up, my ‘ohana frequented Hā‘ena on the weekends, visiting friends and family. Fresh fish and music was always on the menu. Fiery woks and 'catch of the day' creatively prepared sparked an early interest in island favorites. "I do not think of myself as a cultural practitioner, but as a foodie passionate over ancestral foods and foods of culture. A journey that guides me through a rewarding career, infusing the past with modern-day flares, creating and inspiring a healther lifestyle of Hawaiian indulgence." “I am from Honolulu on O‘ahu. I have lived on Kaua‘i since 1970 where I taught history at Kaua‘i Community College for 36 years, including Hawaiian History and Kaua‘i History. When I was in high school, back in the 1960s I spent parts of several summers on Kaua‘i, and like many visitors to Hā‘ena, I helped to plunder its reefs, spearing many lobsters and more fish than I needed. It was only later that I learned about the need to mālama (care for) the ‘āina (land). "As a professor I led many field trips to Wailua and ā‘ena and other special places on Kaua‘i, including Ke Ahu a Laka, the famous hula platform where dancers from all of the islands come to ‘graduate.’ One of my daughters, Kanani o Makana, is named in honor of the mountain that towers over this site. “With my wife Barbara, I’m the caretaker, docent for the Wai‘oli Mission House Museum in Hanalei, Kaua‘i, Hawai‘i. 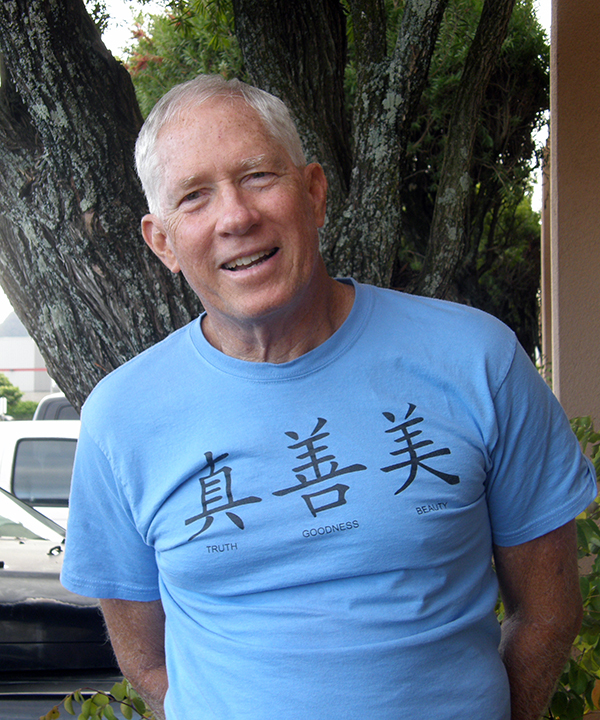 I’ve been living in Hanalei for the last 45 years. I got this job in 1998, which I started studying about the missionaries coming to Kaua‘i and teaching the Polynesians, the Hawaiians, how to read and write their own language. “I am from the ahupua‘a of Wailua nui a hoano, ka moku o Puna. I run a cultural enrichment program called Nā Pua No‘eau at the University of Hawai‘i and probably the biggest part of my job is community outreach in rural Hawaiian communities. What I do is I create a bridge for Hawaiians, young Hawaiians, kamali‘i childen, ‘ōpi‘o, youth that are looking to pursue an education beyond high school. And I try to create that bridge for them in discovering their passion. 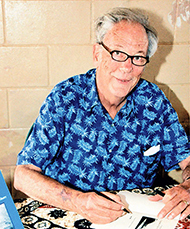 The late Frederick "Uncle Bruce" Wichman, whose shared his books on Kaua‘i legends and spoke with us about traditions of Kaua‘i and Hā‘ena. 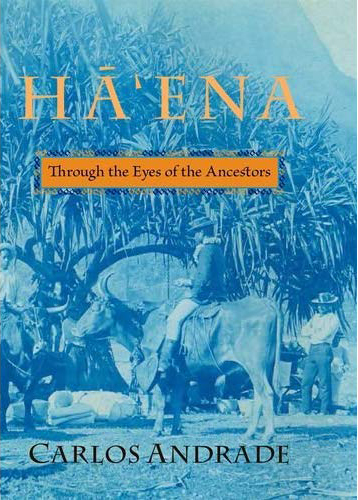 Through this people who have generously shared with all of us their insights and exerpeices, we gain first-person insights into life and legend in Hā‘ena, past and present. 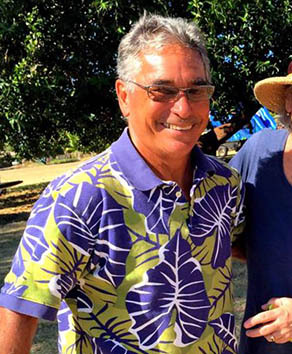 Their stories and knowledge are supplemented by historical records, maps, photographs, and contemporary writings, as well as insights on Hawaiian life and culture from the writings of Mary Kawena Pukui and Samuel Manaiakalani Kamakau. Pacific Worlds welcomes you to explore this beautiful place through a series of ten thematic topics. Within each of these, you will find short, focused sections exploring particular aspects within that theme. Provided also are bibliographies and links to external sites that will teach you more about the topics discussed.